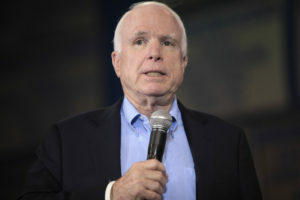 What is discernible in this enigma, indeed obvious, is that the logic’s lodestar, the lodestar of McCain’s very existence, is an almost heart-breakingly deep love of his particular country – not because it is his country, but because it is a noble one. But beyond that, an observer could guess wrong a thousand straight times as to which combination of love and anger, canniness and openness, momentary passion and far-sighted sagacity would manifest itself in his behavior. Assuming an underlying commitment to principle, McCain rightly identified the two keys to such statesmanship as 1) willingness to compromise on means and lesser ends in order to… 2) make “incremental progress.”…. I myself would have voted “yes” to keep that bill alive, rather than the “no” vote that McCain cast. But it would have been a close call. The bill as it existed was a mere shell of legislation, a pathetic excuse for a vehicle to keep Obamacare-replacement alive in hopes that somehow a Conference Committee could, behind closed doors, have produced something actually worthwhile. But as McCain said in his floor speech described in the column above, and as I also have argued for months, what really should have happened all along was the full committee process with open hearings, an invitation for two or three moderate Democrats to come on board, and a massive attempt to actually explain to the American people what the reformers are trying to accomplish and how it would provide a better system. In other words, the usual bill-writing process, what’s known as “regular order,” should have been used all along, in conjunction with better attempts to persuade the public. Although we’ve lost more than half a year while trying the top-down, closed-door process that now has failed — which is why, reluctantly, I would have tried to save this attempt by going to Conference Committee, because time’s-a-wasting — there is something to be said, something very good, for pulling the plug on this sham. What this means is absolutely not that health-care reform/Obamacare replacement is dead. What it means is that the Senate now must go back to the drawing board, using regular order, and this time perhaps actually produce something worth passing. That is the actual import of McCain’s vote: a return to regular order that is both fairer to all sides and that is more likely than not to produce legislation that better serves the American public. There is nothing wrong, nothing at all, with McCain making such a prudential decision. It was an honorable decision, even though most conservatives, myself reluctantly included, would have made the other decision and rolled the dice on a Conference Committee. The vituperation being sent McCain’s way is unjustified. Indeed, some of the same conservatives who had conniption fits when the House was pushing a much better, much more useful bill through to passage in order to “give the Senate something to work with,” because the conservatives demanded much fuller and more perfect “repeal,” are now the ones blasting McCain for killing this sham, this embarrassment, of a much-worse shell of a bill than the one they said the House should never pass. The hypocrisy of these conservatives is astonishing. The patriotism and principle of McCain is undiminished.